The National Human Radiobiology Tissue Repository (NHRTR) is a tissue collection associated with the Registries. The NHRTR is comprised primarily of tissues obtained at autopsy from USTUR Registrants. It includes frozen and acid-digested tissues, as well as histological slides and tissue blocks. The NHRTR also houses an existing collection of tissue materials obtained from the terminated Radium Worker study at Argonne National Laboratory and historical plutonium injection studies. These unique collections of tissues, records, and related materials are available to other researchers studying radiation effects, cancer, and other biological phenomena. The USTUR acquires post-mortem samples of body organs from volunteer donors who worked with actinide elements and who had a documented intake of one or more of these radionuclides. 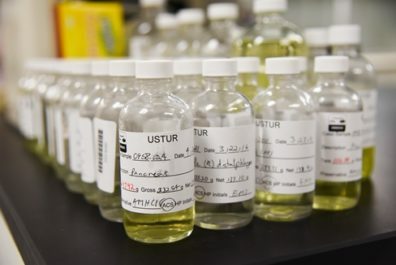 A portion of the tissues received by the USTUR is radiochemically analyzed to determine the concentrations of actinide elements in various organs. The remaining portion is retained in a frozen state for future studies. The NHRTR holds approximately 9,000 frozen and formalin-fixed tissue samples from 40+ whole-body and 100+ partial-body USTUR donors. A wide range of tissues is available including samples from the bone, lung, lymph node, liver, kidney, and brain. Tissue samples are predominantly stored in a frozen state (-30 deg C); however, some samples are formalin fixed. The NHRTR also holds approximately 10,000 acid-digested tissue samples, hundreds of tissue blocks and histology slides, and tissue samples from surgical specimens. USTUR donors were occupationally exposed to plutonium, americium, and/or uranium. Uranium-exposed workers include both individuals who worked at national laboratories and those who were uranium miners and/or mill workers. Additionally, tissues are available from three whole-body Registrants who had been injected with Thorotrast during medical procedures. USTUR Registrants have also authorized the Registries to obtain their individual medical and radiation exposure records for research purposes. These records, in combination with the results of radiochemical analyses of tissues collected post-mortem, provide a unique opportunity to test and improve actinide biokinetic models. The NHRTR houses thousands of frozen, ashed, dried, and plastic embedded bone samples from the radium studies carried out by Argonne National Laboratory/Argonne Cancer Research Hospital, the Massachusetts Institute of Technology, and the New Jersey Radium Research Project. Bone samples (and numerous soft tissue samples) are marked with a unique identifying number. These case numbers can be used to retrieve de-identified case data from publications such as Argonne National Laboratory-Argonne Cancer Research Hospital’s The Argonne Radium Studies: Summary of Fundamental Data ANL-7531 and ACRH-1061 (view excerpt or full text). These data include the person’s source of exposure (dial painter, therapeutic injection, etc. ), estimated body burden, radiochemical results, and medical history. From 1959 through 1985, Los Alamos Scientific Laboratory (LASL) analyzed tissue samples, collected at autopsy, from several geographical locations in the United States.2,3 Acid-digested tissues (acid solutions) from these populations studies are stored at the NHRTR. Dissolved tissues include: lung, lymph nodes, liver, bone, kidney, gonads, thyroid, and spleen. Miller C.E, Hasterlik R.J, Finkel A.J. The Argonne Radium Studies: Summary of Fundamental Data. Argonne National Laboratory and Argonne Cancer Research Hospital report ANL-7531/ACRH-106. 1969. McInroy J.F. A True Measure of Exposure: the human tissue analysis program at Los Alamos. Los Alamos Science. Number 23: 234-255; 1995. McInroy J.F., Campbell E.E., Moss W.D., Tietjen G.L., Eutsler B.C., and Boyd H.A. Plutonium in Autopsy Tissue: a revision and updating of data reported in LA-4875. Health Phys. 37: 1-136; 1979.